The Montecristo Mini is a bold and tasty cigarrito, of 20 ring gauge and 3.2” (82.55mm) long. It comes in 10 packs of 10 cigars. 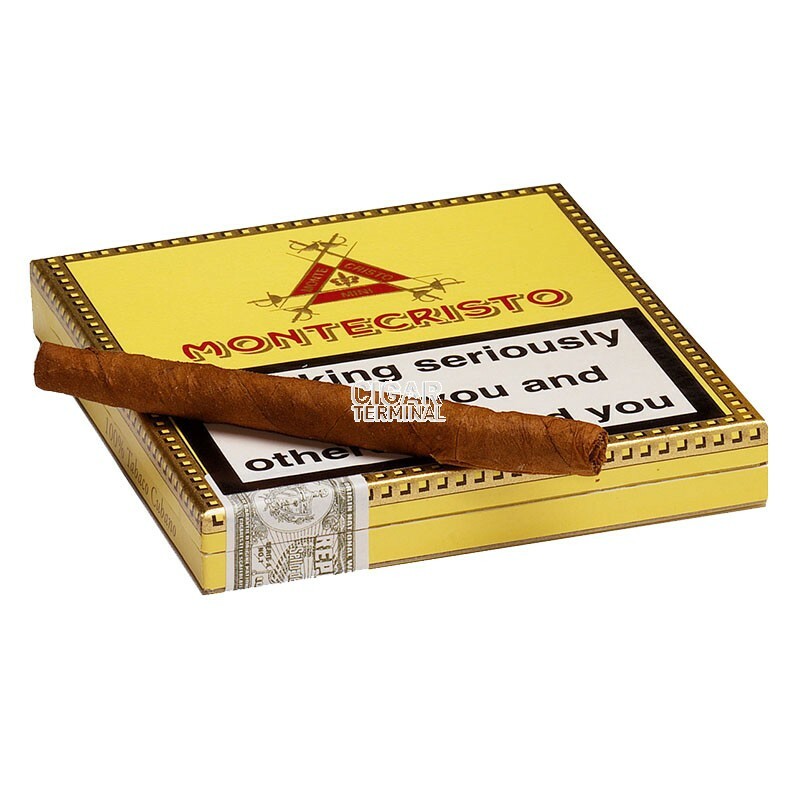 A wonderful cigarrito that packs all the typical Montecristo flavors in a 20 minutes smoke. • Not too strong neither too easy smoke. • Remarkable woody taste with lots of spice. A nice little stogie that will please both new-comers to Cuban cigars and experienced smokers. The Montecristo Mini is a small machine made in Cuba and is packaged without band. The wrapper is of medium brown color. It is soft to the touch and matte. The cigar is pre-cut so no cutter is required for the Montecristo Mini. Classical Cuban smell exudes from the wrapper. It is a high quality cigar. The construction of the Mini is very good and the cigar burns well, but somewhat fast. Like any good thin cigar, the draw has just the right amount of resistance. The ashes is compact and of dark grey color. The Montecristo Mini starts off with some intense flavours of tobacco and wood. For now, the cigar is light to medium in strength. In the middle third, the strength of the Mini increases substantially, and it is now a medium bodied cigar. There are ample aromas of nuts, cacao and spices. In the final third, the Mini reveals all its complexity, with deep woody flavors mixed with typical Montecristo tobacco flavor. The strength increased again, to a medium to full cigar. The spicy touch increased as well and tickles the mouth. In summary, the Montecristo Mini is a great short smoke that packs all the classic Montecristo flavors and complexity. Would recommend it to a novice or even a Cuban aficionado. Its small price makes it a favorite go-to cigar.